I make a good number of snacks and even desserts for my family each month. Since my three children are ages 2-7, I like finding or creating great treats that are fairly healthy. I adapted our favorite and frequently made chewy granola bars recipe to make an even better one. Peanut butter granola bars pack a flavorful punch and satisfy the sweet tooth with minimal sugar. 1. Lightly grease an 11x17 pan. 3. In a small saucepan, melt butter, honey, and brown sugar together over medium heat. When it comes to a boil, reduce heat and cook for 2 minutes, 15 seconds to 2 minutes, 30 seconds. 4. Remove from heat. Stir in peanut butter and vanilla until thoroughly mixed. 7. After bars have cooled for 10 minutes, sprinkle mini chocolate chips on the pressed granola. Using wax paper, press the chips into the granola mixture. 8. Cut into bars when completely cool, after about two hours. 9. Store bars in container with a lid in layers divided by wax paper or wrap individually in plastic wrap. Keep at room temperature or freeze. To freeze granola bars, wrap individually with plastic wrap. Place wrapped granola bars in a freezer bag or freezer safe container and place in freezer. To eat, thaw for a few minutes. I've never skipped the chocolate chips in the peanut butter granola bars, but I think you could. These granola bars are adapted from our chewy granola bar recipe. The original recipe has become a favorite for multiple friends and family members. One friend even dipped and drizzled the granola bars in chocolate for her daughter's classroom treat. Both recipes are worth trying, but the peanut butter granola bars are our favorite. We prefer Jif creamy peanut butter. As you can see from our photos, sometimes I cut the granola bars to be similar in size to store-bought, but I have found they transport best when shorter and wider. 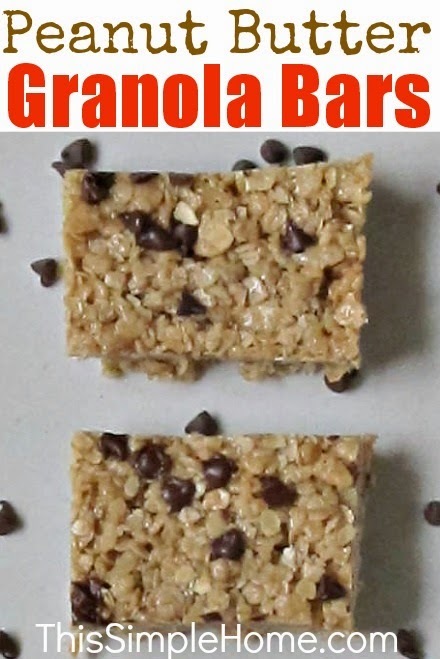 If you like the idea of chewy granola bars, but can't use peanut butter, then be sure to try the original chewy granola bar recipe, linked below. What's your family's favorite healthy (or healthy-ish) snack? Be sure to check out all of our recipes along with the original chewy granola bar recipe. Our granola recipe has no sugar...just honey to sweeten it. I would really like to try making my own granola bars. We cannot use quick oats, though, because we are gluten-free. What happens if you use rolled oats, or even steel cut? Here's my thought. I've made no-bake cookies before with rolled oats and they were fine. And...it's the same process of bringing the sugar/butter to a boil and adding oats after. These are certainly worth trying with rolled. If the rolled oats work well, I would then try steel cut, but suspect the texture may be a bit off. Let me know how they turn out. I am loving how these look, you had me at peanut butter but when I saw chocolate chips....now I know what I want to a afternoon snack! Oh these look so good. 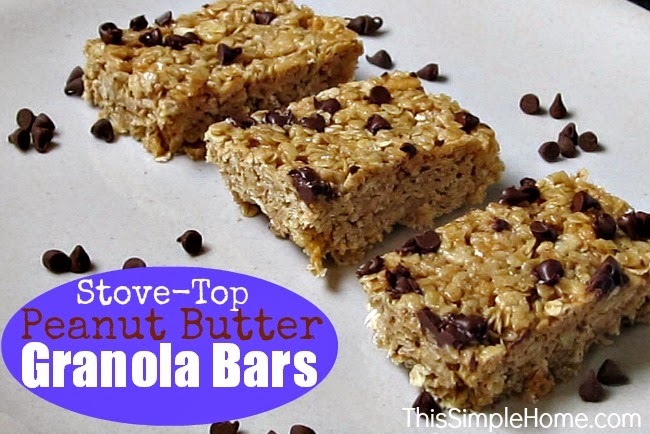 Like a cross between a chocolate chip cookie, oatmeal cookie and granola bar. Pinning! These look SO good! Unfortunately I couldn't let my daughter take them with her lunches because her school has banned peanuts due to students with allergies. Yummy! I love granola bars and I love peanut butter. What a perfect combination for a nutritious snack! They look delicious. I totally want one now ... but that won't work. ;) I'll have to consider making them. Can't wait to make this!! Thank you so much for linking up at Tasty Tuesday! Your recipe has been pinned to the Tasty Tuesday Pinterest board! Please join us again this week!